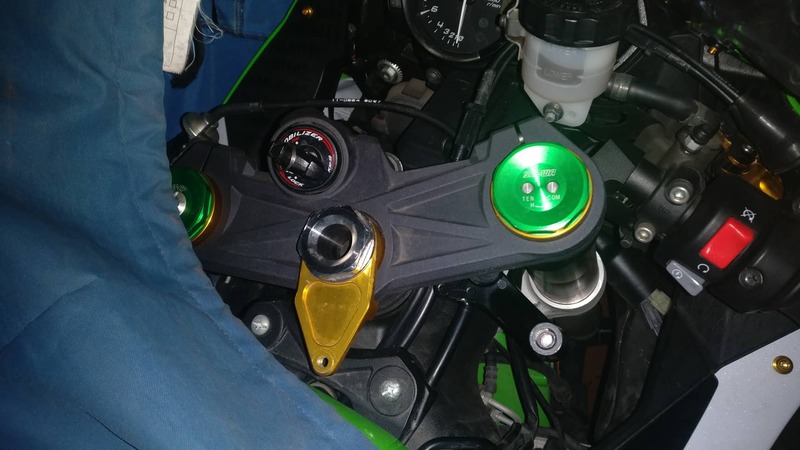 First of all let me say that since I bought the zx6r 2015 half an year ago I was lurking here, but after I encountered an issue I had to join the boat and start a thread which going to help to everyone who is in need of steering damper for the zx6r 2013+ model. So my story is that I bought a steering damper from Bitubo which I was certainly sure it will come with the mounting brackets, but sadly it didn't so now I'm stuck with a damper with no way to mount it. Cost a total of 150$ (that is without my country taxes which will make it 250$). 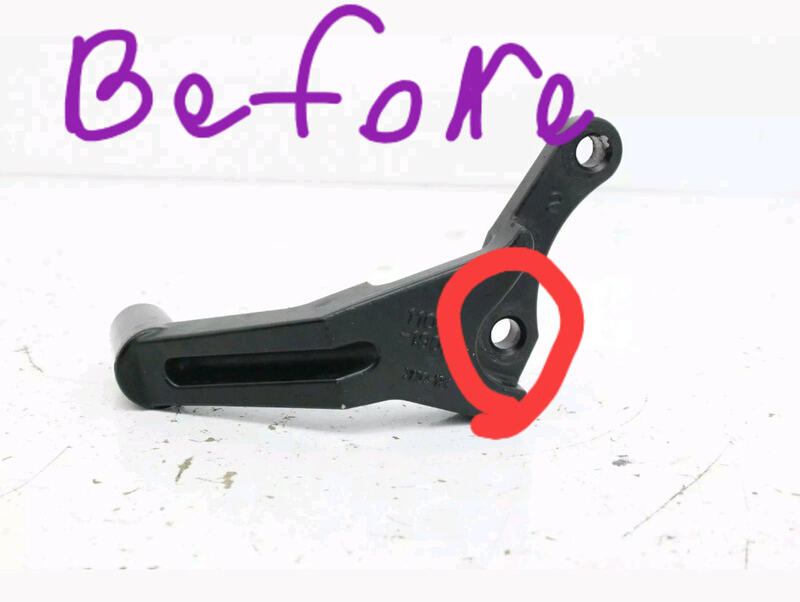 I started looking for a bracket that will fit or make a bracket, so I got some Chinese "Matris" zx6r mounting bracket but the diameter of the clamp is big (25mm while the Bitubo is 22.8mm) and I have to use something to fill the gap between the damper and the clamp (big room for errors). 11054-1903 - Triple bracket of a zx10r 2010, cost me 10$ on eBay, now all I had to do to fit the part to the triple, this required modification and basically just make on of the holes bigger (used a drill and just drilled a bit and checked a couple of times until the hole was perfect size), when you install it you'll see that there is a part touching the clip-on secure bolt, so i just used a small spacer and now the part is sitting great with good clearance to the gas tank. 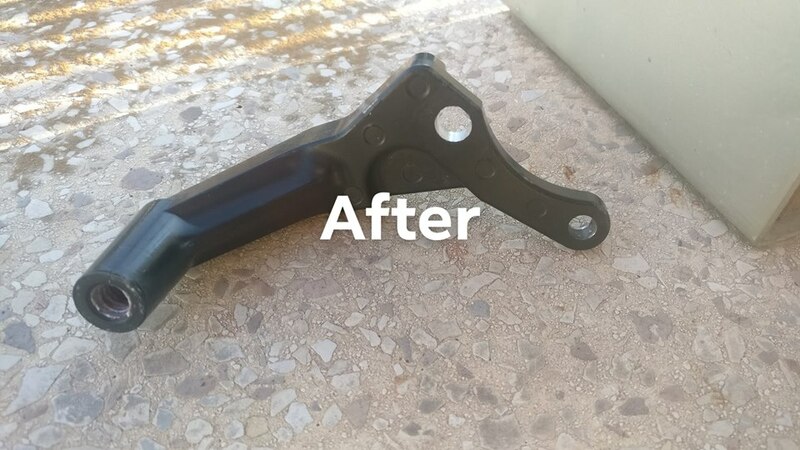 Now I have to find a gas tank bracket, I ordered a zx6r 2009 bracket because i understood that it can be used on the 2013+ model (Part: 11055-1147 cost around 18$) but it's on a back order, So I'm thinking of getting the original one that fits 11056-2315 which is like 37$ (Double the money) and there is the zx10r mount (Part 11054-0023 / 11054-0023-18R) but not sure if it will fit on the zx6r. Meanwhile hopefully the part will arrive soon so I can update with pictures. Thanks for reading and hope it helps anyone. 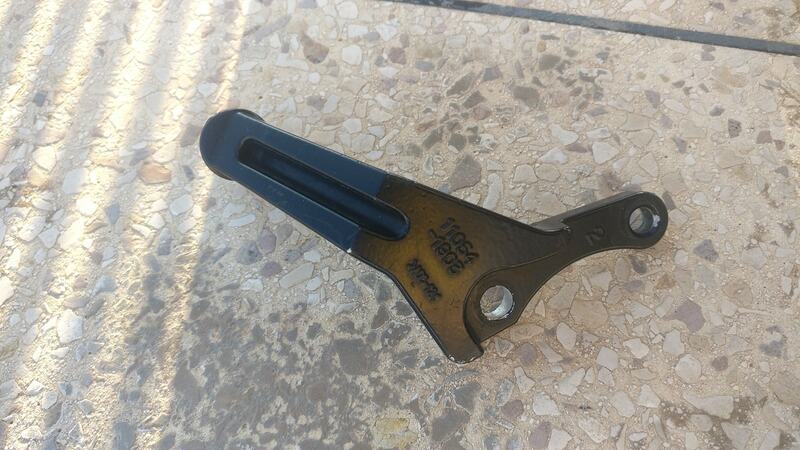 *The steering stem bolt and weird gold bracket in the pictures is from the Chinese bracket. So partzilla just told me that it's on back order and it nation wide or something like that which means there is no ETA on that. If someone is selling this part: 11055-1147 please let me know, right now project is delayed until i can get my hand on this bracket. I bought a Chinese type damper just for the fitting kit for the reasons you describe. My plan is to replace the damper tube with a well known one once i get to give it a try. Not sure if this is any help to you. Mind checking the damper diameter for me? It'll be very helpful. what does the ohlins mounting kit do that the above doesnt? Ohlins mounting kit doesn't fit the Bitubo damper, i tried it. The Matris / Hyperpro can fit but the diameter has differences. OEM ZX6R steering damper kit (the Kawasaki version Ohlins SD021) is a BS damper and needs to be revalved (even if you buy the kit from factory). The Ohlins SD042 is the steering damper you want if you into Ohlins, only thing is that this damper cost a fortune. GPR V4 - great damper but heard it has to be maintained quite a lot due to leaking from now and then, comes with mounting kit. TOBY - didn't really get a review and feeling of it but heard it's nice, comes with mounting kit. 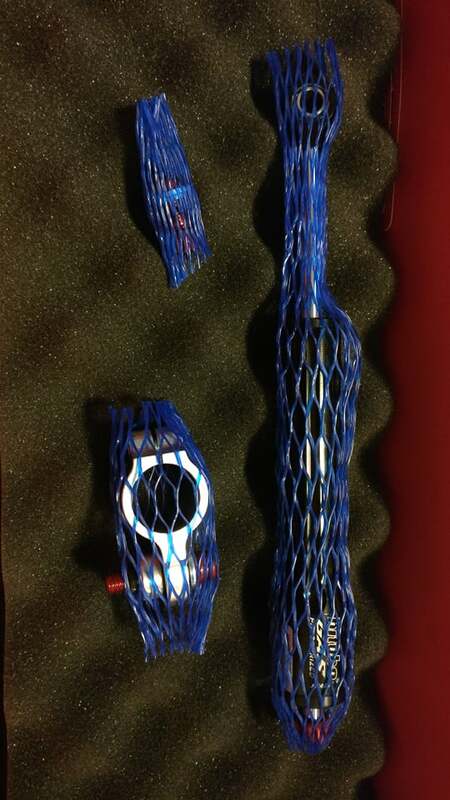 Hyperpro - heard good things on them, comes with mounting kit. Last edited by Fiftythree53; 03-12-2019 at 02:36 AM. Ahhh, well - that scuppers my plans! I was planning on getting a hyperpro as the one on my zx10r worked perfectly well and wasnt insanely expensive. Yep! And if you're on a budget just buy a used one. There are lots for sale in great condition. I bought one for $225 in perfect condition that I used for like 4 years on a different bike. The one on my R3 I think I got for $200, but then I had to buy mounting brackets from Graves so that brought up the total to about $300. Still way less than $500-600. The thing I like about Ohlins (besides that they're the best at what they do), is that there's a lot of literature out there for their products and you can learn how to service them pretty easily. And if you don't want to, there's always a shop that has the tools and knowledge to work on Ohlins. Bitubo though...Bitubo who?? You're right, Ohlins is the most known company for suspension period. But it doesn't mean other products are lesser, more like lesser known. I did my mistake buying this, no need to give me hard time for it. Copyright © 2006-2012 ZX6R. All rights reserved.